I went through several of my crochet books looking for directions on how to make picots. Seems there are lots of ways. I think I found a new favorite technique. It wasn’t in any book just a combination of the different styles. Each sample in the photo is worked right to left, as are most crochet stitches. Picots that face down are called dropped or drooped picots. I found this out in a couple of reprints of an antique pattern books. 1. From Donna Kooler’s Encyclopedia of crochet. I don’t like these. 2. 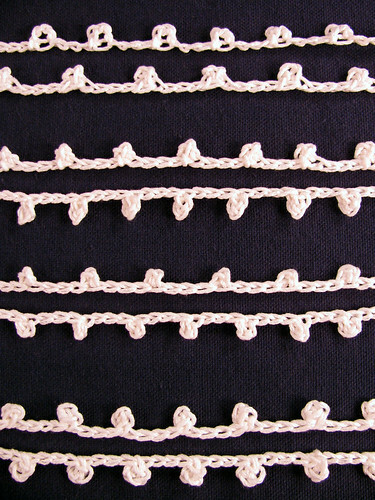 Picots closed with single crochet stitches instead of a slip stitch. 3. This is the way I usually made mine in the past, closed with a slip stitch, as I explained in yesterday’s blog post. 4. Dropped picot formed by removing hook, putting it the joining stitch, rehanging the end chain, closed with a slip stitch. 5. Removed hook, pulled end of chain through joining stitch, holding picot to the right, continuing in chain stitch. 6. Removed hook, pulled end of chain through joining stitch, holding picot to the left, continuing in chain stitch. 7. Similar to row 3, except I curved the picot around to the right on my middle finger before slip stitching closed. 8. Similar to row 3, except I curved the picot around to the left on my middle finger before slip stitching closed. I think from now on I will make picots like the ones in rows 7 and 8. I like how round they look. Who said an old crocheter can’t learn new tricks? This entry was posted on Monday, February 23rd, 2009 at 3:00 am and is filed under Crochet. Tagged: Crochet. You can feed this entry. You can leave a response, or trackback from your own site. I like the bottom two best as well with the top two being my least favorite by far. I really like that you explored all the methods. I tend to do that a bit as well too to find out what I like best. It’s always a fun exercise!